Seated at a long wooden table that’s dressed in a crisp white tablecloth for a Champagne lunch at Orange’s Racine restaurant, I can’t help thinking that still-life painter Margaret Olley would have loved the many wonderful things that are arranged in a considered yet somehow haphazard way. Everywhere I look there’s another delightful ensemble of everyday man-made objects and pieces plucked from nature that Olley could very well have set up herself. Herbs in terracotta pots framed by sparkling wine and Champagne glasses grace the tables; a handwoven gardener’s basket filled with fat pumpkins and purple carrots is surrounded by bunches of grapes, dried flowers and twigs of rosemary; a Chesterfield-style faded green velvet couch and a few simple wooden chairs sit against a corrugated iron wall beneath a web of fairy lights. And the place is positively peppered with flowerbeds and veggie patches. I’m in Orange for its famous F.O.O.D Week and my senses are already in overdrive. I can see why this picturesque city attracts hundreds of artists and producers of fine food and wine. People stroll into the buzzing garden party, whisking up a glass of champers before taking their place and introducing themselves to neighbours. Recent tree-changers and tourists do their best to blend in — carefully selected RM Williams outfits and still-stiff Akubras are quite clearly not as farm-worn as those sported by the locals but it’s an incredibly merry bunch and lunch, and the locals are keen to embrace those who have come to experience this beautiful place. Every shared platter is a delicious arrangement of local produce accompanied by something Racine does exceptionally well — breads and pastries. There are exquisite dips, wines from newcomer Nashdale Lane (they do a sauv blanc that will lure chardonnay and pinot grigio fans to the other side), quiches whipped up courtesy of the free-range chooks’ eggs and bowls laden with verdant salads, everything picked from the surrounding gardens. Treats from Racine Bakery follow, including a soft banana bread that melts in the mouth. I learn over lunch that Orange isn’t named after the citrus fruit, as most assume. It’s actually a city with roots planted in apples and gold mining; early explorer Sir Thomas Mitchell named the parish Orange as he’d been an associate of the Prince of Orange in the Spanish Peninsular War when both were aides-de-camp to the Duke of Wellington. Armed with this information, I farewell my new-found friends and head off into town to enjoy some of the many offerings that have been excitedly discussed at the table. Montoro Wines is a must for shiraz lovers and architectural buffs. Yes, it’s shiraz-only on this lush land. Owner and winemaker Bob Derrick is a long-time resident and former science teacher. His and his wife Jennifer’s passion for wine and design has resulted in an extremely classy, pared-back cellar door featuring black wall panelling and polished concrete floors. Outside, the signature element of this stunning cellar door — designed by Source Architects — is the suspended concertina roof that soars majestically into the sky, balanced on two sturdy metal frames that straddle the entire glass-box building and a sprawling outdoor deck area. The scene is complete with border collie wine dog Bailey bounding about, a happy host with a lotta love to give. In 2017, Montoro won seven gold medals and a trophy at the Sydney Royal Wine Show, NSW Wine Awards and Orange Wine Show, across its eight varieties of shiraz. The Derricks have been selling grapes for years to other winemakers but in 2013 bottled their first wine; since then they’ve been busy making more space for awards. With a half-bottle of white shiraz (Bob’s mother reckons that’s the perfect amount for a drink) tucked into my backpack, I head off to Heifer Station Vineyard, perched upon the volcanic basalt slopes of Mount Canobolas. The vineyard was once part of a much larger property used by Cobb & Co as a change station for their horse fleet, and was one of the biggest cattle stations in NSW. At an elevation of 900 metres, it benefits from a balance of elevation and sunshine, making it highly suitable for growing chardonnay, pinot noir, pinot gris, merlot and shiraz grapes. The winery is owned by Michelle and Phillip Stivens who bought the property after nearly 25 years in the corporate world. An old wool shed serves as the cellar door, popular with families for the onsite resident herd of alpacas headed by ‘Snowy’ and a petting zoo and fun farm adjacent to the cellar door where kids can feed chooks and goats, and view highland cattle, sheep and the winery’s mini Shetland pony, Tilly. Next I head into town to visit Ferment the Orange Wine Centre, which is housed in a gorgeous heritage building. Owner Simon Forsyth has installed three Enomatic wine-dispensing systems in this super-cool bar, so guests can taste more than 50 local wines at their leisure. It’s packed all year round from what I hear, with tourists and locals. After sampling a few varietals, I walk down the road to my abode for the next few days — Mercure’s hotel in Orange, Templers Mill. It recently had a refurb and the rooms are spacious and modern, and most importantly it’s within walking distance for everything in Orange. However, a surprise awaits when you climb the stairs to the transformed rooftop of the Ex Services’ Club. 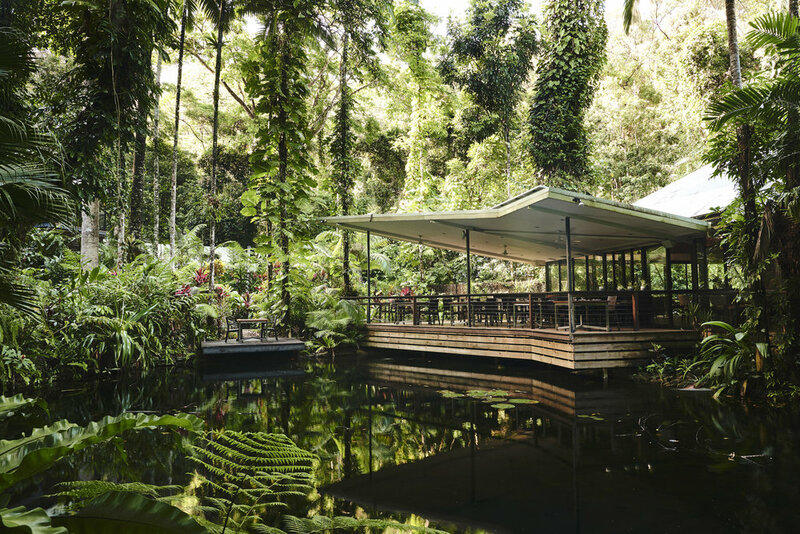 Here I discover The Greenhouse, which celebrates local and regional produce at affordable prices in various spaces that are reminiscent of Sydney’s The Grounds. There’s an enormous café complete with hanging herb and flower gardens, a pizza bar dishing up some of the best in Orange, a children’s play area/park, and a hall that looks like a rustic stable housing a restaurant and bar. A street food kitchen set-up and a fine-dining degustation option in a more formal dining room setting complete the picture. My days in Orange are filled with visits to more wineries, farms and niche sellers of lovingly produced delicacies, and walks down leafy streets awash with autumnal colours. I check out hazelnut production at Fourjay Farms, sample deliciously plump olives and good preserves from Kalavista Organics and Franklin Road Preserve, and discover the many different flavour sensations of Fresh Fodder dips. I take a half-hour trip out of town along sweeping valley roads to the beautiful property where The Beekeepers Inn sits in all its glory, surrounded by farm implements from days gone by. 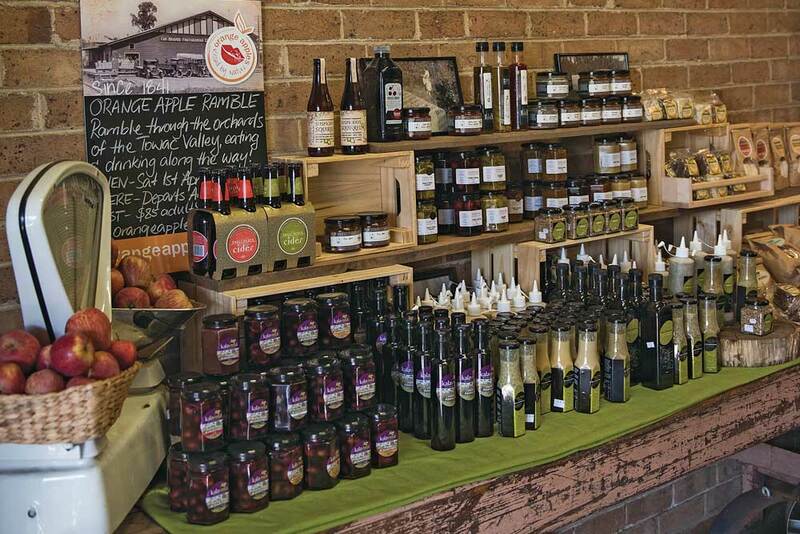 Here you can enjoy some of the best homemade scones, cream and jam in the region, and honey-lovers will be in a spin over the varieties of the sweet stuff available: coolabah, blue gum, stringy bark, yellow box, lucerene, mugga iron bark and Christmas mallee. On my last day, in need of a truly Orange sunset, I join a holistic vineyard tour with vigneron James Sweetapple and his two dogs, at his beloved Cargo Road Wines. He takes guests through the process of growing grapes and making wine, then gives an engrossing talk about how he and his fellow vignerons strive to take care of the land that feeds them. As the sun sets, a golden light has the wine in people’s glasses glowing. The dogs leap around under the vines and gumtrees, and a kookaburra lands on a fence post to take a close look at us as we happily swill the good stuff. Looking out over the rows of vines and up at Mount Canobolas, I can’t help but smile. And as I sip my wine I think — everyone I’ve met in this beautiful place has mastered the art of being Orange.